Where do Air Scouts meet? In an airplane of course! Over the years Scouts have met in some very strange places. 1st Pinner Green Troop met in a disused laundry in 1929, Southwold Scout Troop met in the town's disused narrow gauge railway station in 1935, 1st Hempton Sea Scouts met in a disused windmill until it was demolished in WW2 and 24th East Belfast even used to meet under a lamp post (in all weathers). 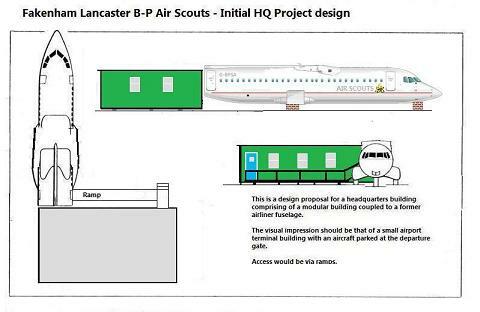 But B-PSA Air Scouts at Fakenham-Lancaster are taking on a new challenge – to recycle an airplane into their own Scout Hut! Fakenham have already moved locations twice due to their continued growth, but now they’ve made the decision to get their own meeting place. Whilst most Scout Groups opt for a village hall, a school or their own Scout Hut, Fakenham have chosen to go one step further by using a Portacabin-style building as their activity area which is attached to a converted airliner fuselage. As the hall and site will normally only be used by Scouts on evenings and some weekends, it is hoped that the site could be made available for use by the wider community. Fakenham have already successfully obtained a suitable building for the project and are currently raising funds to apply for planning permission for their project. To find out more visit www.fakenhamlancasterscouts.org.uk. If you’d like to donate to Fakenham’s efforts then please visit here. Air Scouts is open to 11 – 15 year olds and follows the scout program with a special emphasise the aeronautical aspects of the programme and arrange air activities. Like our Scouts, Air Scouts regularly go on outdoor adventures including camping, hiking, rock climbing, swimming, kayaking and various international camps and Jamborees. To learn more about scouts, please visit the Scout Section or Contact Us.